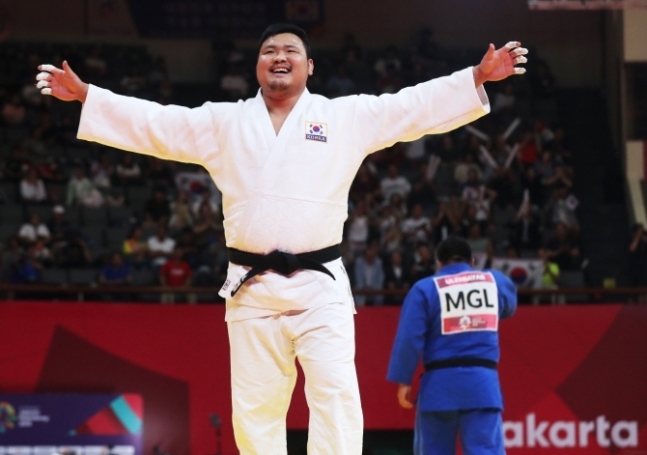 South Korea's Kim Sung-min won the over-100 kilogram division in the men's judo competition at the 18th Asian Games on Friday. Kim beat Duurenbayar Ulziibayar of Mongolia in the final at Jakarta Convention Center Plenary Hall in Jakarta to take a gold medal. This was Kim's first individual gold at the Asian Games. He won gold in the team event at the 2014 Incheon Asian Games but took bronze in the men's over-100kg.